I have a little Houdini on my hands. You know Houdini, right? The "magician" or whatever you want to call him who could get out of anything, anytime, anywhere? Well, that's Izzie. Since experiencing the house outside of her little caged-in living room playspace (thanks Doug), she is flat-out refusing to stay put. I can't turn my back for more than a second before she is either diving head first over the dinosaur toy that keeps her in the living room, or trying to crawl underneath the table next to the dinosaur toy. It's maddening! 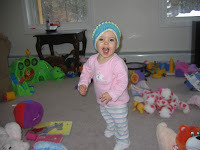 And of course, when I put her back in the living room, she screams like I have just removed a limb with a butter knife. I know she's thinking "well, mommy has lots going on, what with Drew going this way and Annie going that way, so I'll just sneak out for a bit and she won't notice a thing." HA. WRONG! I am a Mommy dear Izzie. I have eyes in the back of my head. Just you wait. So, Annie and Izzie have found another new way to make me, and Doug, go completely nutso. It's called the "Diaper Olympics". My mom coined the phrase way back when with Meg I think, but the twins have taken it to a new level. When we are both home, we each diaper and dress a girl in the morning. We really should take one at a time, because this is how it goes: chase either baby until you catch her; throw her on your lap; pin her down with elbows, bricks or other heavy objects because if you don't, she will twist, turn and do whatever she can to throw herself off your lap; if you're lucky, you get to clean her bottom (always tricky if it's a #2 diaper! ); then wrestle her back into a clean diaper and try to put some clothes on her; why bother with socks, and she'll just remove them the minute you put her into a car seat. This is NOT a spectator sport by any means. Diapering an upside down baby is a total drag. Then the girls do the most adorable things, and the Diaper Olympics are forgotten for a moment. Annie loves, loves, loves her blanket. She would carry it around all day if she could. 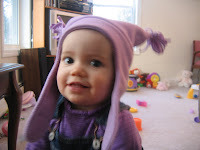 She puts it on her head (Linus would be her best friend) and walks around bumping into things. And she has this cute little baby voice, and she looks at you with her big brown eyes, and has an entire conversation with you that sounds something like this: goo goo, blah blah blah, mamamamamamamamamama. We have no idea what she's saying, but we nod our heads and smile back. OH MY GOD it's just so cute. And Izzie is our thumb sucker. Now don't go telling me that it's bad and we should make her stop. She only puts that little thumb in her mouth when she naps (or while I'm trying to feed her lunch. grr.) while holding onto the ear of a little pink lamb. The thumb sucking is new to us~neither Meg or Drew ever sucked their thumbs. Izzie can't go to sleep without her lamb, which is why it amazes me that she chucks them so unceremoniously from her crib (yes honey, gravity DOES still work after all these years) and then stares at them and yells for them. I wonder if she thinks they'll just climb back in? Who knows. Oh, and they kiss each other, on command. Big, open mouth sloppy kisses to each other. It's adorable. And they kiss Meg and Drew, on command. Annie kisses us more than Izzie does though. She is our huggy, kissy girl. She walks right over (oh yes, did I mention that she walks and has been since she was 10 months old) and puts her head on my knee and pats my leg. Izzie uses my legs as some sort of a mountain~she grabs onto them to pull herself up, then tries to use my shirt to pull herself onto my lap. I'd hold them all day if I could, but then the dishes wouldn't get done, the floors wouldn't get swept, and I'd never get to go to the bathroom. And since they're finally napping, I should take this opportunity to do some housework.